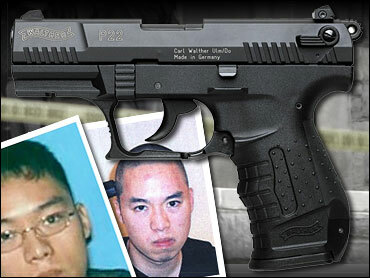 The 22-caliber Walther semi-automatic pistol used by Cho Seung-Hui in the Virginia Tech massacre was purchased on the Internet from a Green Bay, Wisconsin-based Web site, The Gun Source. Cho bought the pistol with a credit card for $267 on Feb. 2 and picked it up one week later, as CBS News previously reported, at JND Pawnbrokers, near the Virginia Tech campus in Blacksburg, Va. In an e-mail exchange with the online vendor, Cho gave his parents' address as his home and wanted an assurance that he was getting the latest model gun. "Is Walther P22 product 10632 second generation? What year was the assembly date?" he asked. Eric Thompson, president of TGSCOM, which owns 50 websites that sell guns, confirmed that thegunsource.com sold Cho the Walther P22. "As a father of three, I was obviously heartbroken when I found out," Thompson said in an interview with CBS affiliate WFRV. "I feel so terrible." Under federal law, only federally-licensed firearms dealers may ship handguns across state lines and then only to other licensed dealers. Thompson said his company is cooperating with law enforcement agencies investigating the nation's worst-ever domestic shooting incident. "Our thoughts and prayers are with the families of the victims," Thompson said, adding that his websites would be adding links to the Hokie Spirit Memorial Fund established by Virginia Tech. More than a month after securing the first gun, Cho bought his 9-mm Glock semi-automatic pistol in person at Roanoke Firearms, paying $571 with a credit card. Virginia state law limits handgun purchases to one every 30 days. In both instances, Cho passed a federally-mandated background check conducted for Virginia gun dealers by the state police. Cho filled out paperwork for the instant check for the Walther at the Blacksburg pawn shop, waiting only ten minutes to be cleared, according to the shop's owner. On Thursday, the Brady Center To Prevent Gun Violence charged that given Cho's history of mental illness and existing federal law, neither of the weapons should have made it into his hands. "If the current law on the books had been effectively administered and followed, this individual would not have been able to buy these guns," said Paul Hemke, president of the Brady Center. The Brady Center relied on the Montgomery County, Virginia, General District Court documents from Dec. 13th and Dec. 14th in 2005, when a special court-appointed justice checked a box declaring that Cho "presents an imminent danger to himself as a result of mental illness." The court proceeding resulted after school officials worried Cho was suicidal and referred him for closer medical examination. The court stopped short of ordering Cho to be hospitalized and instead ordered him to undergo outpatient treatment. Paul Barnett, a lawyer who serves as the special justice of the general district court three days a week and oversaw the Cho case, told CBS News that when deciding these cases he prefers the least restrictive option. Barnett, who handles 60 to 80 assessments every month, declined to discuss Cho in detail. But he said when weighing involuntary commitment, he relies on more than one mental health professional, including an evaluation from someone not affiliated with the institution where the individual might be sent. The only evaluation among the Cho court papers declared the college student depressed but not suicidal. "His insight and judgment are normal," wrote Dr. Ray Crowe, who concluded 16 months ago Cho was not a danger to himself or others and did not require hospitalization. Virginia State Police said consequently Cho was not prohibited from buying a gun, according to state laws, because he was never committed to a mental health facility. The Brady Center suggested the 2005 court judgment should have blocked Cho from ever owning a gun, because federal law prohibits the selling a gun to anyone who has been adjudicated "mental defective" or ever involuntary committed to a mental institution. "Somebody in the Virginia apparatus made a mistake in interpreting federal law and with tragic consequences," said Brady's legal director, Dennis Henigan. The FBI's National Instant Criminal Background Check System (NICS) manual states in all caps: "ONCE A PERSON IS DISQUALIFIED ... HE/SHE IS PROHIBITED FOR LIFE!" The FBI seemed to defend the Virginia Thursday describing it as "the leading state in reporting mental defective entries for the NICS index," having submitted more than 80,000 mental health records since the database's launch in 1998. Currently only 22 states submit mental health records to NICS. Legislation being prepared by New York Congresswoman Carolyn McCarthy would require all states to track individuals with mental adjudication records and disqualify them from owning guns. McCarthy's husband was killed and her son seriously wounded in a mass shooting on a Long Island commuter train.